microwave energy it is important not to defeat or tamper with the safety interlocks. limitations on how long an implied warrantylasts, so the above limitation may not applyto you. respect to the magnetron tube in the Product for parts only. Labor is not provided free of charge for this additional period. Servicer or Dealer, call Sharp tollfreeat 1-800-BE-SHARP (1-800-237-4277). be heated in this oven..
basement or near a swimming pool, and the like..
14o Do not let cord hang over edge of table or counter. 15_ See door surface cleaning instructions on page 22.
hood (louver) or grease fitters. damage the louver and the grease filters. 20. This appliance is suitable for use above both gas and electric cooking equipment 36" wide or less. 1, Charcoal FillerKit (RK-220),,This is requiredwhen hoodexhaustis recirculated.See CharcoalFilter Kit on page 23. If yourdealer does not stock this item, itcan be orderedby calling1-800-BE-SHARP. wire for the electdc current,. the correct electrical connection procedures,. hear the magnetron cyclingon and off. ones° Ventilation openings must not be blocked. casseroletype dishes. See peg e 12 for completeinstructions. to dry clothes or newspapers..
Youroven is rated 850 watts using the IEC705-1988 method..
" Heat baby food in original jars.
" Heat bottles with nippleson. overcooked can smoke or ignffe. * Meat and poultry show no pinkness. "Fish is opaque and flakes easily with a fork. "Paper towels are good for covering foods for reheating and absorbing fat while cooking bacon. because heat is kept near the food to hasten cooking. that need tenderizing. DO NOT use metal twist-ties. Remember to slit bag so steam can escape. been cooked to safe temperatures° Sharp is not responsible for any damage to the oven when accessories are used. pull down on the oven door. One touch DOOR OPEN button. FAN HI / LO button. 11_ Time display: Digital display, 99 minutes 99 seconds. The turntable wil! rotate clockwise or counterclockwise. and the turntable on the turntable support. !__! L-J L-J f._..I L_! The oven display will then begin flashing _]. TURNTABLE and ON indicators will go on. 2) Touch the STOPtCLEAR pad.
" Suppose you want to defrost for 5 minutes at 30%. for 45 minutes on 40% power..
with a dry cloth or paper towel..
remaining cooking time appears on display. whether the turntable is off or on,. for baking would be room temperature. when the turntable is off..
in the chart for these foods. and moisture when cooking bacon and potatoes. overlap two pieces at least one inch to cover..
don'/need to calculate cooking time or power level..
After cooking, let stand, covered, for t to 3 minutes. * Suppose you want to use Sensor Cook to cook bacon. Wash and peace in casserole. Add no water if vegetables have just been washed. Place in casserole. Add t-4 tbsp. water. over the rim of plate° Cover with paper towel. underneath)° Cover with plastic wrap. After cooking, tet stand, covered, 3 minutes. Less_ Drain cranberries and reserve liquid. paper, Microwave using SENSOR REHEAT Less. using SENSOR COOK 4 for bacon. Crumble and reserve bacon. Instant Sensor BAKED POTATOES. Vegetables should be tender. HIGH (100%) until thickened, 4 to 6 minutes, stirring several times. wrap_'Microwave using SENSOR COOK I for fresh vegetables, soft. Allow to cool 5 minutes before serving. 1. Scoop out zucchini slices with melon bailer, leaving a 1/4-inch shell. Sprinkle inside with garlic salt. Set aside..
4_ Stand, covered, 5 minutes,. appears on display,. Let stand, covered, 5 minutes. 2. Microwave using SENSOR COOK 2 for fresh vegetables, hard. Ai_ow to stand, covered, 5 minutes. COOK 2 for fresh vegetables, hard. Carrots should be tender-crisp, Drain,. 2, Stir in remaining ingredients_ Cover and microwave using SENSOR REHEAT. bread crumbs in a small bowl. Fill each mushroom cap with 1 tablespoon of mixture Cover with vented plastic wrap..
Microwave using SENSOR REHEAT.. Let stand, covered, 5 minutes. 3o Sprinkle with Parmesan cheese and serve. 2., You may choose to enter the weight in tenths of pounds. 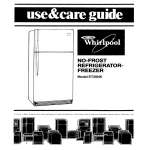 If the food that you wish to defrost is not listed on the COMPU DEFROST CHART or is above or betow the limits in the "Amount"
estimated defrosting time, program the oven in 1 minute increments on Power Level 3 until totally defrosted. and cooking time for foods shown in the chart. Less Time AdjustmenL See page 20.
allow to stand 10 to 15 minutes. Internal temperatures should be 170_F. down quickly to 0 and the "End". should never be serviced by a "do-it-yourself"
NOTE: If time appearing in the display is counting down very rapidly, check Demonstration Mode on page 20 and cancel. The outside surface is precoated metal and plastic Clean the outside with mild soap and water; rinse and dry with a soft cloth. frequently with a damp cloth. Avoid the use of harsh abrasives. or use any sort of chemical cleaners TAvoid the use of excess waterr Close door and touch STOP/CLEAR. Wipe interior with a soft cloth. 2,, Soak the filters in a sink or dish pan filled with hot water and detergent. For other uses, select either Hi or LO speed..
1. DO NOT leave range unattended while using high temperatures. surface units. This may cause spattering or believer. 3.. Keep grease filters clean. the circuit breaker panel or by unplugging..
use such as a night light. every 6 to 12 months depending on use. 4. Remove and save one Phillips head screw from oven light cover. Rare: 7-9 min_ per lb. Well: 12-14 mino per lb. Rare: 5-8 min. per lb. Mad. : 7-10 min. per Ib. Wel! : 9-11 min_ per lb. plate or on a rack. 2<it. casserole,= 2 tbsp. water. Wash° Leave 1 inch of tops. 2<it. casserole. 1/4 cup water. 2<it, casserole,, 2 tbsp water,. Cover., Stir after 3 rain. Cover. Rearrange after 4 rain. 1-qt casserole° 1/4 cup water. Cover. Stir after 3 rain. casserole° Cover., Stir after 5 min. 1<it. casserole. Add no water. Coven Stir after 2 min. Prick; place on paper towels. 3 min., Uncover during stand. water,. Cover. Stir after 3 min. dissatisfied for any reason, simply return the book and we'll gladly refund your money. For more complete information and safety )recautions, refer to the inside instructions. 2, During defrosting, oven will stop. for a ,5 Ib, increase per touch.